(1) Ignore the bullying complaints, or deny or minimize them. It’s very difficult for a child or young person to come forward with complaints of being bullied in the first place. The negative acts involved in bullying like name-calling, taunting, mocking, spreading rumors, social exclusion, or throwing things at the victim are humiliating. No child or young person wants to be disliked by peers and to have to disclose to an adult that they are targets of bullying can be a source of further shame. Additionally, kids frequently internalize the humiliation to which they have been subjected and begin to wonder whether they, in fact, deserve it. Kids believe that telling an adult won’t make the bullying stop or will actually make it worse by subjecting them to further retaliation. They question whether teachers and school administrators are really committed to stopping bullying. (2) Justify doing nothing about a bullying complaint because the kid making the complaint is troubled, has family problems, or has been labeled as a whiner. Bullying is a public health problem and requires a community-based response to reduce and prevent it. Kids who already have emotional or psychological problems, family problems, or who are new to the neighborhood or school are more vulnerable to the effects of bullying. For these kids immediate and effective intervention may be life-saving. In a sad and ironic twist, kids who entrust information about their psychological or psychiatric problems to their peers and who end up being bullied may find that the very information they shared with their “friends” is now used to humiliate them. For example, kids diagnosed with ADHD who are on Ritalin or those diagnosed with depression who are on anti-depressants and who share that information in an act of trust can find it coming back to haunt them in the form of taunts and belittling if they are bullied. Pre-existing personal or family problems don’t negate the impact of bullying; they amplify it. (3) Blame the victim or make the victim responsible for stopping the bullying. Telling kids who are victims of bullying to work it out between themselves, to toughen up and get stronger, to ignore it, to be more friendly, or to reconcile with the bullies are all versions of either blaming the victim or putting the responsibility for solving the bullying problem on the shoulders of the victim. None of these so-called solutions are likely to work and recommending them will serve only to cause further injury and suffering to the victim. To solve the problem of bullying, kids need the leadership and support of knowledgeable and compassionate teachers and parents who are willing to talk about bullying and its effects and who are willing to intervene actively to stop it. (4) Believe that bullying is an isolated problem. In 2009, the National Center for Educational Statistics reported that 28% of students between the ages of 12 and 18 acknowledged being bullied during the school year. However, when the question posed is whether kids have ever experienced bullying or have ever been the target of verbal abuse or public humiliation, the percentage of kids who say that they have been the target of such abuse at some point in time goes as high as 75%, depending on the study. Bullying occurs in multiple locations in the school, including in teacher-supervised classrooms, as well as in off-school locations, in homes where parents are present, in school buses, in car pools under the noses of parents, and on the internet. (5) For schools, fail to have a clear anti-bullying policy that is enforced. Kids, parents, and school personnel are often unclear about what kinds of behaviors are bullying behaviors. To help raise awareness about bullying and, for the sake of fairness, a clear definition of what bullying is and the kinds of negative acts involved in bullying, together with a description of its harmful effects, should be included in anti-bullying policies. Within a particular school or school district it’s important that a shared understanding of what constitutes bullying be developed. Additionally, a clear description of the consequences for participating in bullying should be spelled out. Finally, anti-bullying policies in place must be enforced because a policy not enforced is often worse than no policy at all. (6) Fail to teach children about kindness and compassion. Bullying is intended to hurt others and cause them suffering and pain. Developing empathy, the ability to appreciate what another is feeling and experiencing, reduces aggression. Empathy, kindness, and compassion are emotional competencies that children need to learn in order to becoming caring people who can participate non-abusively in relationships. Parents who are willing to share their own emotions with their children and talk about the importance of understanding another person’s perspective and feelings are raising emotionally fluent children and, in the process, working to prevent bullying. Teachers and schools can also help by teaching empathy and tolerance and by modeling attentive and caring practices of conflict resolution. (7) Don’t provide training or learn about how to respond to bullying. There is no question that responding to complaints of bullying can be difficult and demanding. Teachers, school counselors, school administrators, and parents are all potential first responders in incidents of bullying. First responders have to be trained. Not enough teachers and school personnel have been provided with adequate training about how to respond to claims of bullying and how to protect victims. Whole school and whole community programs to address and prevent bullying from the ground up rather than the top down are needed. Communities like South Hadley, Massachusetts that have been rocked by the suicides of young people who were bullied are demanding education and accountability. No community wants to get on the map because it mishandled bullying in its midst that led to grievous harm to its children. 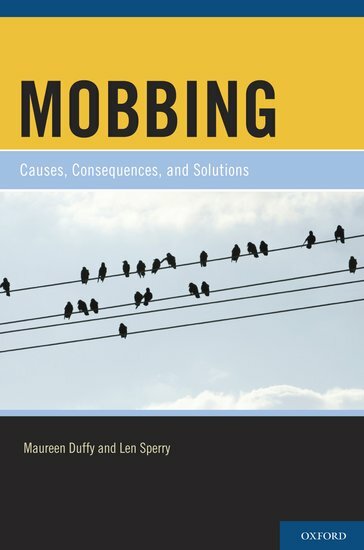 Maureen Duffy is a family therapist, educator, and consultant about school and workplace issues, including mobbing and bullying, and is the co-author of Mobbing: Causes, Consequences, and Solutions. She maintains an active clinical and consulting practice that includes clients who have been injured as a result of mobbing and bullying. I am a high school teacher and I want the reader’s of this blog to understand the immediate need for this information to be spread among all of the stakeholders in the bullying arena. Bullying is a particularly insidiuous action and does irreparable damage to those it harms and their families. I applaud Ms. Duffy’s work in this area and I especially respect her context for “emotional fluency” and the nature of “first responder” to the act of bullying. I believe she creates a very clear picture of the bullying process and what all of us need to do to combat this deadly problem. My son was bullied at school many years ago and the teachers and parents of the bullying kids blamed him and said he was causing it by over-reacting. Years later the teacher went to a conference on bullying or a workshop and called me and apologized. I was impressed with her apology so many years later and also that things were changing because of awareness and education.